Good preparation is the key to your MTB adventure on the Stoneman Taurista. Whether in one, two or three days - the Stoneman Taurista is an extraordinary mountain bike experience in any case. You can choose your own starting point - just as it suits you best. You can also choose the date of your ride within the season completely free. The Stoneman Taurista Mountain Bike is located in the Salzburger Sportwelt in the heart of the Salzburger Land in the centre of Austria. The route is ideally located near the Tauern motorway (A 10/E 55) (Altenmarkt  and Flachau  exits). By car it takes just under an hour from Salzburg and just two hours from Innsbruck, Munich, Linz and Graz. Radstadt is ÖBB's national railway station.. The MTB route of the Stoneman Taurista runs clockwise and is fully signposted. The signs will show you the way. They are usually located before and, as confirmation, 100 to 200 m after the crossing or the divergence. Gold-riders should nevertheless use a GPS device with the current track as a precaution. You will receive it with your registration via e-mail. On site, the current GPS track for the Stoneman Taurista is also available from the issuing points of the starter packages and the logis partners. Each starter pack comes with a detailed route map (77 x 70 cm) showing the route and the characteristics of the individual stages. This way, you will be well-prepared for your bike tour on the Stoneman Taurista and have an overview of important places along the way. In September, gold is only achievable to the most experienced riders. Each starter pack includes a leaflet with riding times and the Stoneman Taurista Rules. Demanding 123 km distance and 4,500 meters altitude gain. The Stoneman Taurista has it all when it comes to technical demands and stamina! The technical demands range from S0 to S2 with a few S3 and three longer carrying and pushing passages. Don't underestimate them! Gold is therefore only feasible for technically experienced and fit mountain bikers. If in doubt, give yourself enough time for your first trip and try for a silver or bronze. 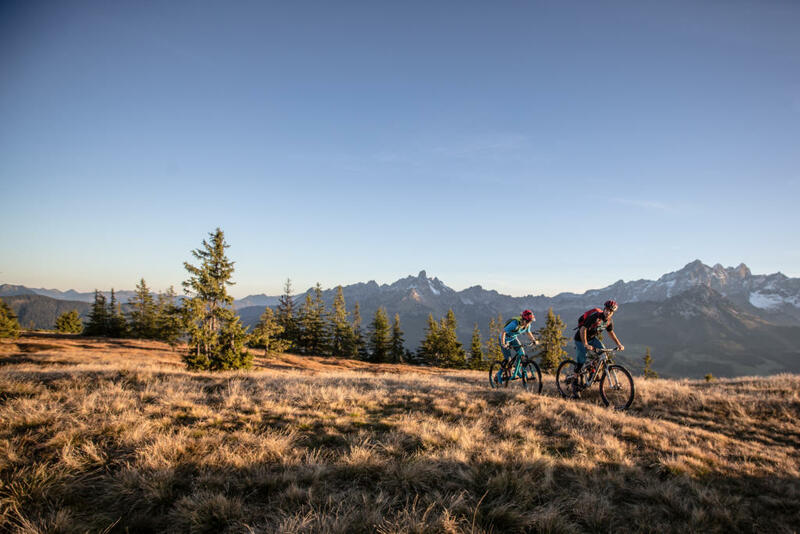 The best starting points for your Stoneman Taurista Mountain Bike experience are the official distributors of the starter pack and the logis partners. Ready for the Stoneman Taurista? If you ride silver or bronze, the Enns cycle path is suitable as a transfer route. It runs from Flachau to Mandling and is fully signposted. From Wagrain, access is also possible on a cycle path. The Enns cycle path is marked on the official route map that comes with every starter pack. Important: During the Stoneman Taurista season, trains and buses in the valley run on a reduced schedule. A shuttle by bike or taxi is therefore the safer option. Der Anstieg zum Rossbrand kostet richtig Kraft. 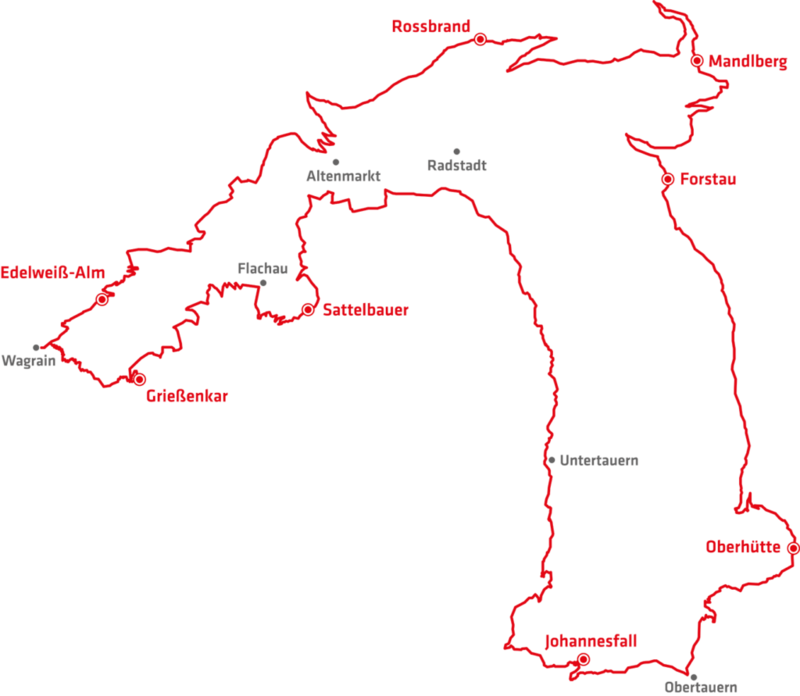 Der Pass nach Obertauern ist eine Herausforderung.